Nitrogen is essential to a healthy lawn. Fertilization with a fast-release nitrogen fertilizer will cause a quick burst of green growth in the lawn. But, this is not always best for the grass. The trick is to use the right amounts of nitrogen at the right times for healthy growth. The chemical nutrients in fertilizer are designated with a numbering system such as 10-8-5. The first number indicates the percentage of nitrogen in the fertilizer, in this case 10 percent. The second number indicates the phosphorus percentage and the third number is the potassium content. Instructions are often given to apply 1lb. of nitrogen to a given square footage. The amount of nitrogen in any fertilizer can be determined by multiplying the number of pounds of fertilizer by the percentage as a decimal. Twenty pounds of 10-8-5 fertilizer would contain 20x.10=2 lbs of actual nitrogen. The same amount of nitrogen would be supplied by 25 pounds of 8-8-8 fertilizer. 25x.08=2 lbs. Fast release nitrogen is available in soluble form for immediate use by the grass. Slow release nitrogen is insoluble and must be converted into soluble form. It is slowly converted into soluble form during warm weather. A good fertilizer program should contain a mixture of fast and slow release nitrogen. Between 30 and 50 percent slow release nitrogen is recommended by the Ohio State Extension Service. Fall and late fall are the best time to fertilize the lawn with smaller applications during the spring and summer. Over fertilization during the growing season causes rapid growth requiring more frequent mowing and also encourages disease and pests. The University of Wisconsin suggests applying 3/4 lb. of nitrogen per 1,000 square feet of lawn in the fall and 1-1/4 lbs. per 1,000 square feet again in the late fall after average temperatures have dropped to approximately 50 degrees F. Apply and additional 1-1/4 lbs. in the spring after growth has started and another 3/4 lb. mid-summer. 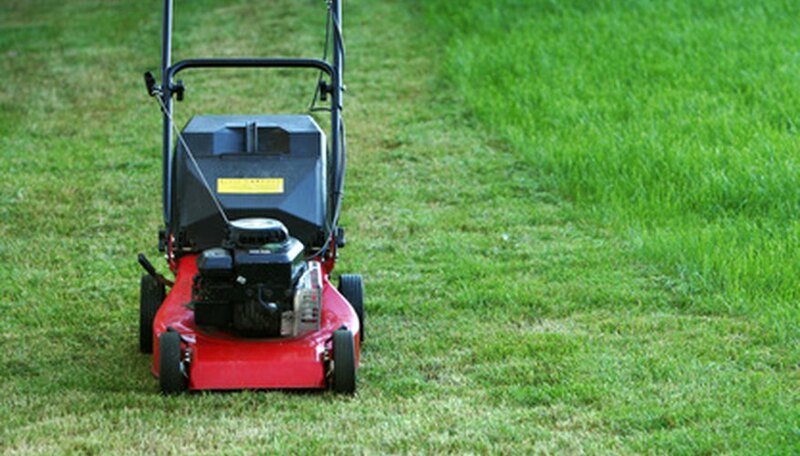 Use approximately 30 percent less if grass clippings are returned to the lawn. Nitrogen can burn the lawn and create dead zones if not applied properly. Fast-release formulas are more likely to burn, but any fertilizer can cause problems. Avoid burn by applying fertilizer to dry grass then watering it in. Spread no more than 1-1/2 lbs of nitrogen per 1,000 square feet evenly across the lawn.